The Im Tirtzu movement works to strengthen and advance the values of Zionism in Israel. Tour organizers expect a turnout of 5,000 students throughout the academic year. The first tour took place on Thursday, leaving from Bar-Ilan University on the outskirts of Tel Aviv. According to Im Tirtzu, the tours provides a balancing point of view in a milieu where radical, anti-Israel groups use tours of the city to slander and delegitimize Israel. They visited the Tomb of Machpela, King David Street (also known as Shuhada Street), the ancient Jewish cemetery, the Tel Hevron archaeological park, the historic Beit Romano building, and the Hebron Heritage Museum. 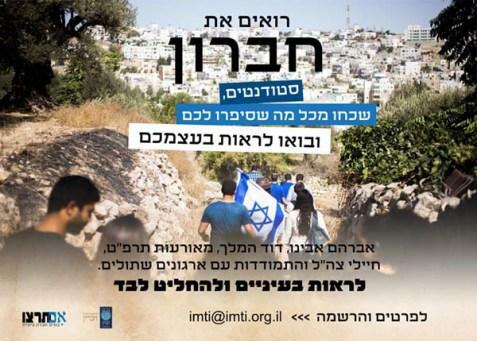 The program is expected to run at all the Israeli universities and colleges with Im Tirtzu groups, including Hebrew University, the Technion, and Tel Aviv, Ben-Gurion, Bar-Ilan, Haifa, and Ariel universities. Credit: JNi.Media. A version of this article appeared in the Jewish Press.